The 4th Avenue Street Fair has been a happening event in Tucson, AZ since 1970. This Tucson street fair is in the heart of Tucson, AZ. On 4th Avenue between 9th Street and University Boulevard. Let’s set the record straight right from the start. The 4th Avenue Street Fair isn’t for everyone. But from the size of the crowds, you wouldn’t know it. Over 300,000 people show up at this biannual Tucson street fair. Yes, that is 300,000 people at each event. 600,000 visitors a year. So if you are someone looking for a secluded and quiet place to spend the day, this Tucson street fair isn’t it. There are two 4th Avenue Street Fairs each year. April and December. Each 4th Ave. Street Fair has 400+ vendors. Arts, crafts, food and drink, musicians and other attractions. Is this five-star dining. Are you kidding? This is a Tucson Street Fair. Food choices range from Sonoran Hot Dogs to pizza. Chinese, Greek, American Food. Roasted corn on the cob. Everything smells great. And it is a people watchers paradise. The local 4th Avenue merchants and restaurants are also open and ready to serve you. And if you have been out in the sun for a while, heading for one of the eateries is a great place. Get out of the sun, have a beverage of choice and something to eat. 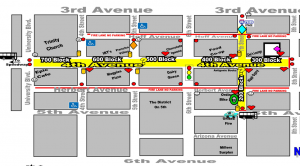 The 4th Avenue Street Fair is a twice a year event that everyone should try. Maybe you will just go once, maybe twice or twice every year. It is one of Tucson’s many attractions. It is not for everyone. But if you like to wander around and see a diverse group of people have fun, it might be for you. Oh, have a beverage of choice and just enjoy the street music and a some Tucson Street Fair food. And if you are considering a move to Tucson, AZ keep us in mind. We can help you find your “perfect” home in Tucson or a surrounding community.